The word ‘comfortable’ was used by many runners to describe the Adidas Climachill Rocket. It had an adequately lightweight nature, noted some testers. The full-length mid-sole was very responsive for a lot of those who tried it. The testers felt that the cushioning system was able to absorb impact shock with ease. Runners stated that the upper cover system felt snug, but not too tight. The ventilation afforded by the upper fabrics made the running experience of the users very agreeable. Many felt that it was true to its size. It was a bit difficult to put on because it lacked an adjustable traditional tongue, stated some runners. The upper mesh material felt tight, according to a purchaser. It was a size smaller than what a tester was used to. The Adidas Climachill Rocket was very much welcomed by many runners. For many of them, it was a comfortable neutral running shoe to have. They also said that the cushioning system was reliable. But there were those who complained that it was difficult to put on. Perfect for the runner looking for an excuse to get out and run: You won't want to stop in these. 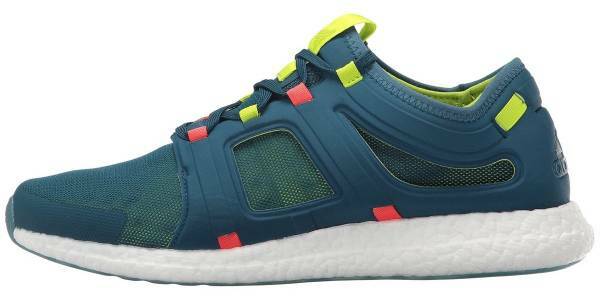 The Adidas Climachill Rocket just like the popular Adidas Ultra Boost is a road running shoe that was created to deliver a comfortable and well-ventilated running experience to the wearer. A technology that adds a cool sensation to the skin makes wearing this shoe more accommodating, especially during warm weather seasons. The other materials used in this model are of high quality and they work in unison to keep the runner engaged and enabled. The upper unit features the climachill™ technology, which is a quick-drying fabric that has perforations for accommodating airflow. This fabric encourages air to enter the shoe in order to keep the foot cool and dry. It doesn’t easily warm up, unlike most fabrics. A sock-like fit is employed in this model, making it non-irritating to the skin. It doesn’t have a traditional tongue, so the front, collar and heel sections of the upper unit make up just one singular frame. The mid-sole unit uses the boost™, which is a high quality material made from the amalgamation of TPU pellets. It delivers sure underfoot cushioning, absorbing impact shock in the process. Its springy nature allows the foot to lift off the ground speedily. The rubber outsole is flexible. It adapts to the movement of the foot and its stance when taking each step, giving full-bodied protection and traction at all times. The Adidas Climachill Rocket has a standard running shoe length. It comes in sizes that adhere to the regular measurements. The available width is medium. It welcomes the runners who have medium sized feet. The semi-curved shape of this model follows the natural curve of the human foot. The rubber material that’s used in the Adidas Climachill Rocket is durable. It capably shields the foam mid-sole from the potentially damaging nature of the asphalt. It also delivers sure traction, which is helpful when it comes to achieving surface control. It’s flexible, so it won’t hinder the natural movement of the foot. The mid-sole unit of the Adidas Climachill Rocket features the boost™ technology, which is a full-length foam unit made from the compaction of thousands of TPU pellets. It cushions the foot landings, attenuating shock in the process. It also causes springy takeoffs. It doesn’t break down easily, so it remains efficient even after many uses. A two-layer mesh material is used in the upper unit. It’s breathable, so it allows air to easily enter the foot-chamber in order to keep the foot well-ventilated. The climachill™ technology delivers 360-degrees of coolness and dryness. It has micro-pores, which act as portals of entry for environmental air. It dries up quickly, too, thus disabling moisture from being seeping into the fabrics. A sock-like fit is used in the Adidas Climachill Rocket. It allows the runner to wear the shoe without socks. It is non-irritating to the skin.